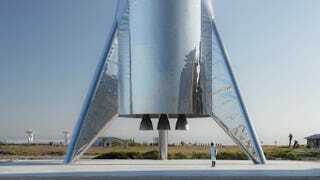 A photo Elon Musk says is of the Starship prototype. 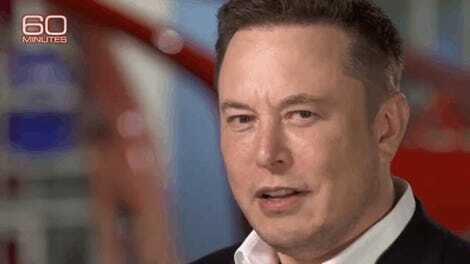 Elon Musk’s prototype of the Starship spacecraft—the payload of a system formerly known as the Big “Falcon” Rocket, and the vessel that may one day shuttle SpaceX colonists to their likely deaths on Mars—fell over in strong winds at its facility in Boca Chica, Texas on Tuesday. However, Musk has characterized the project in south Texas as involving “subsections of the Starship Mk I orbital design,” adding that it is not actually built to full height. Referred to as a “test hopper” by Musk and SpaceX Chief Operating Officer Gwynne Shotwell, documents filed with the Federal Communications Commission and obtained by SpaceNews show the prototype is intended fly both low-altitude tests of no more than 1,640 feet (500 meters) and high-altitude tests of no more than 16,400 feet (5,000 meters). On Jan. 5, Musk tweeted that he was aiming for the first tests of the prototype in “four weeks, which probably means 8 weeks, due to unforeseen issues.” Presumably, blowing over in the Texas wind will set back his timetable a bit.